In this book, both Tillich's nothingness and that of Barth are investigated, especially in their doctrines of God, Christologies, anthropologies, and understandings of the problem of evil, which will lead to a better understanding of their existential analyses of being and non-being and their implications with their Trinitarian God. To accomplish this task, a comparative study is engaged by examining the understanding of nothingness of theologians Paul Tillich and Karl Barth. The differences and similarities in their understanding of nothingness will be examined. 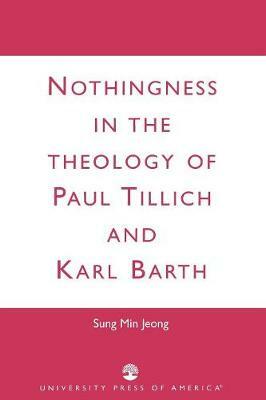 This study is formulated to show how Tillich's nothingness is different from that of Barth. Tillich's understanding is philosophical-theological and it goes beyond that of traditional metaphysics. That is, Tillich's theology differs from the metaphysics of Hegel and Schelling that are ideal and abstract. In this sense, the objective of this study is to demonstrate that Tillich's philosophical theology can serve as a source of mediation between philosophy and theology. At the same time, this study will show that Barth's nothingness, as an evangelical-biblical understanding, is very significant in defending Christian faith. That is, this study will lead us to know that Barth's theology of nothingness safeguards Christian faith from being trivialized and marginalized by liberal theology.